A big thank you to Jes2G for creating this lovely award. I absolutely love it. I’m soo Bad I neglected to display it before now. 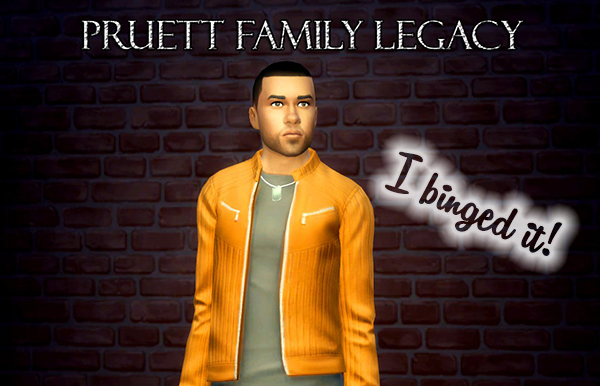 If you haven’t read the Pruett family legacy I recommend you drop everything and do it now!! He He! Although the Vogel legacy story has been told, If you have enjoyed following them on the road we call life I do have a few other stories completed as well as works in progress. I have listed them along with a short synopsis. Wow we’re at the end of this family legacy . I’ve had a lot of fun playing with them and watching them grow. The Vogel’s will always have a special place in my heart. I hope you have enjoyed following their journey as much as I have. Although it’s supposed to be about the Heir Zahir, due to lack of household funds He spent every spare moment writing books and attending work in the writer career. Which is not at all interesting to read about so I guess I focused more on his children. Generation 8 will just really continue their story with a deeper understanding of them and reasons behind their actions. I hope! Got another big update coming soon. Our family is now at generation 8 in-game. So generation 7 Heir Zahir’s story will be added sometime this week. Happy Simming!! Another big update there are a whopping 7 new chapters to read. And since I won’t be updating again till next year XD. Just finished a huge update I think I’ve added 8 chapters. Just about ready to start the start the next Generation. I’m waiting for Get Together I want Oake to join a few Clubs only a few days to go. I’m loving Oake , He’s a little different to the former Vogel Heirs. I think were going to have fun with the new expansion pack ❤ Enjoy reading and Happy Simming!! Yep managed to get a couple of chapters up before the school holidays ended. I’m going to start the Next gen in 2-3 weeks when the vote closes. So there will be a few more chapters between now and then as the boys have just aged into teens. I still get them confused even now that they have different hair. Who knew triplets would be so hard Lolz. Just to let my readers Know I have not abandoned the Vogel family. I am taking a short break due to the school holidays. We will be up and running again before you know it. Expect new chapters in September.